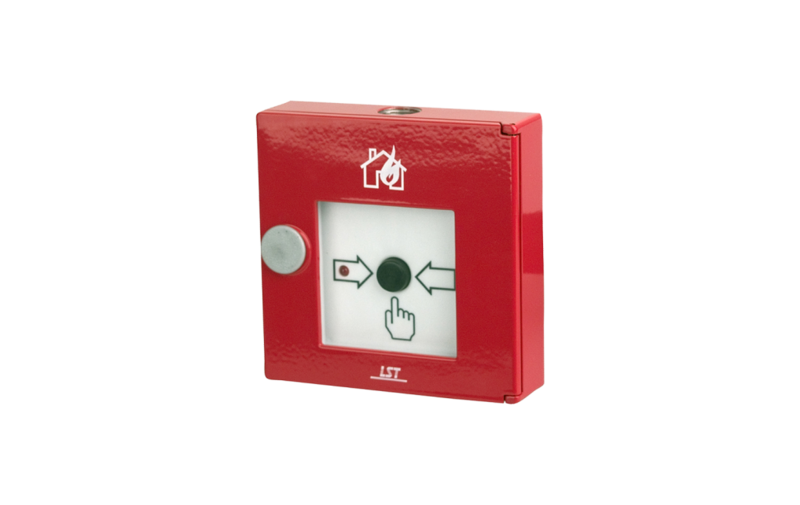 The manual call point according to EN 54-11/B is designed for application in addressable conventional technology and is accommodated in a robust die-cast aluminium case. In comparison with plastic cases, the aluminium case proves to be of advantage even after years of use, thanks to its resistance to environmental impact: It is virtually unbreakable, form stable and hardly changes its colour in sunlight. A built-in LED optically indicates the activated condition of the manual call point. Individual detector addressing is achieved by connecting an optional address module. The hinged door can be opened up to an angle of 180° and it is provided with a replaceable pane of glass. If the detector has been activated, an integrated locking device prevents the closing of the door. Custom versions with different colours, designs, functions and internal wirings are available on inquiry. By means of the optional Protection Kit HFM/HM-ZS-IP54, the protection class can be increased to IP54.